SP2016 students: You should be able to purchase a Kindle version of this book on Amazon for this class. You don’t need a Kindle. You can download a Kindle app to read the e-book on PC and Mac, tablets and smartphones. Norman Borlaug was a scientist . . . actually, he was a plant pathologist. He made tremendous strides in wheat breeding to develop productive, disease-resistant wheat. But he did much more than that. In Societal Issues: Pesticides, Alternative and the Environment (PLNTPTH 4597) for Spring 2016, we will read Our Daily Bread: The Essential Norman Borlaug by Noel Vietmeyer (see note under the book cover about purchasing a Kindle version available for PC and Mac, tablets and smartphones). It’s Borlaug’s life story, and there are several reasons I chose this book for the class. First, I think many will find inspiration in the stories about his education and career – and how he overcame incredible obstacles just to go to high school, let alone college. There are some great examples about how Borlaug’s earlier experiences in school and work would come back to help him in the future, often in unexpected ways. You might not see value in some of your classes or jobs today, but as you go forth in life, your past experiences may prove to be very beneficial. For Borlaug, these experiences were life-saving. Second, the book gives us some insight into life in the Depression era. There are some parallels with difficult economic times today, but Borlaug’s story gives us an idea of the harsh realities of the day. Third, scientific achievement isn’t just about the science alone. Borlaug developed new wheat varieties, but it took a lot more than science to move these wheat varieties to the farmer’s fields. He faced even tougher challenges with cultural attitudes, acceptance, political opposition, economic pressures, and personal loss. He had to be a scientist, maverick, diplomat, ambassador, teacher and so much more. 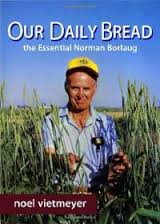 When Borlaug died in 2012, news headlines read, ‘Norman Borlaug: The Greatest Person You’ve Never Heard Of.” Read the book, and see if you agree.